Yesterday I wore my new FRYE harness boots and I felt like a rock star! Seriously, what is it about a pair of boots that can transform the way it makes you feel? I strutted around all day in pure heaven, these boots are so comfortable I may end up wearing them every day. Versatile enough they can be worn with jeans, leggings, skirts and dresses. Pimp them up or down to personalize your own style. The Frye Boot company was founded in the mid 19th century. It is the oldest shoe company under continuous operation in the United States. The founder, John Frye was actually a shoemaker that had immigrated to the United States from England. He ran the Frye boot company for 50 years before his family took over upon his death. During the Civil War, many of the soldiers wore them. They were also on the feet of soldiers in the Spanish-American war as well as Rough Riders led by Teddy Roosevelt. In 1938, John A. Frye’s grandson agreed to make a pair of Wellington’s for a U.S. Navy Admiral because he had a difficult time finding the style he liked. After that, orders started pouring in for the same pair of boots and Frye continued to fulfill these orders through the Second World War. Frye supplied thousands of their Wellington’s, known as Jet Boots, to the soldiers in the army. Even General Patton wore a pair of Frye Boots. In the 1960's, Frye reintroduced the Campus Boot based on its 1860 original. The style featured a bulky toe and chunky heel that came to epitomize the attitude and the style of the 60's and 70's. There was nothing like the "new" Frye Boot on the market, and consumers began to demand "Original Frye's." In 1975 the Frye Company donated a pair of Campus boots to the Smithsonian Institution, in our nation's capital, as a representation of the era. Campus: The Campus boot has a rounded toe, and a low chunky heel. Available for men and women in natural leathers, this is a great casual boot to wear with jeans for an all American look. Harness: These boots have an elongated toe with a squared off tip, and a low chunky heel. They feature a “harness” ring and straps around the ankle. Harness boots are available in styles suitable for men and women. Cavalry: A squared-off toe box, slightly higher heel, and thick soles characterize the Cavalry style boot. Men’s and women’s sizes are available. 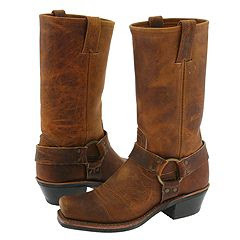 Western: These Frye boots are the classic western shape; elongated pointy toe and chunky heel. Western boots feature details like embroidery and are available in a variety of colors and patterns. Work: Frye makes a variety of work style boots in “engineer” and “logger” shapes. 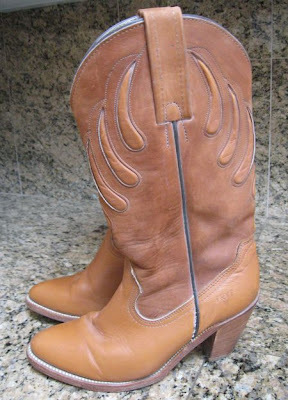 We've recently added a pair of vintage FRYE boots to our GlamourSavvy website. These boots are made for walking and may even make you feel like a rock star too!